Scooters and things: Lets Go Faster! Back to Project Dead Ped. This was a project I started from a trashed 1998 Honda Tact, This is my main mode of transport here in South Korea. It has a 2cylcle 50cc engine, Normally it takes about 3 minutes to completely warm up so I can go the maximum speed of 35-37mph max. So the question is do I need to go faster? Probably not, But…. I don’t care about Probabilities. So im writing down my list to keep things organized. 1. Derestrict the Variator. This should add at least 3-4mph. 2. Ram Air Cooling. This should keep the air foils on the piston cooler. 3. Snorkel / Cold Air Intake. Why not! This place has a monsoon season. I need to be able to cross deeper water. With my intake 6 inches from the ground this would Hydrolock the engine. 4. 8” Lift Kit, because I like jumping and going offroad with the scooter. The one problem I will have with my project is that the budget is 0. I figure this will make things interesting, and I will not have to worry about wasted money when I fly back home. Below is the List of Items I have gotten so far for free. This list may grow as time goes on, but I believe that I have enough to do all the work I need, however I have very few tools to do this with and it is actually difficult to find a Tool shop in my area. Good thing I watched all the episodes of Macguyver. Below is a Great Video Set on how to Derestrict you 50cc moped/scooter. Hats off to the guy who made this. This is probably the most in depth modification i have seen. 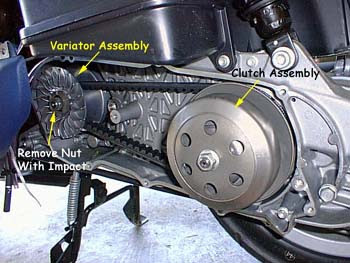 If you are wanting to add a few extra MPHs to your ride, and you have a Vaiator, or Duel Variator system, Then pay attention. If you get a chance thank this fellow, he spent alot of time to do this, and its not even his first lanuage. 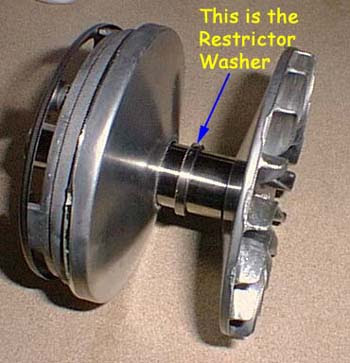 Below are some great shots of restrictors and variators i have found on the web. If you do this, you'll have to figure out a way to ship it home.